How do I setup my preferred stores? To save your preferred stores you must be a registered member. If you are not a member, start by signing up. 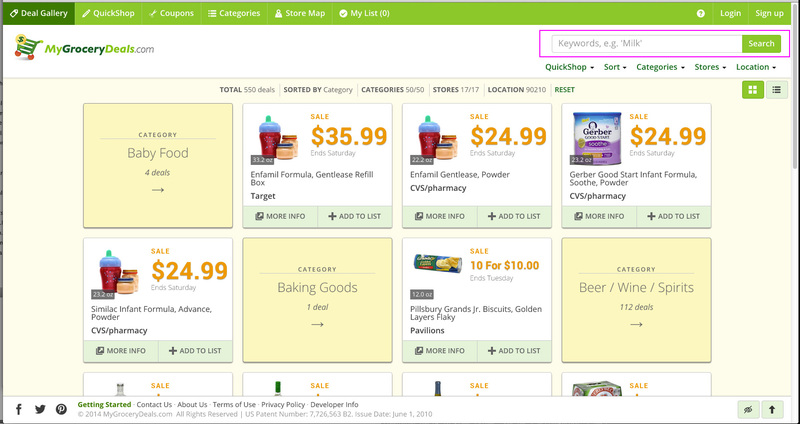 While logged in, click on Store Map in the navigation bar. Set your location using the form above the map and then select your preferred stores using the checkboxes. Once you have checked the ones you want, click "Save As My Stores"
Whenever you return to MyGroceryDeals and log in, the Deal Gallery will only show deals from your preferred stores. I can't find the store I want in the Store Map. Where is it? Currently the Store Map only shows the nearest location for each retailer. We decided this was a good approach so that members in major cities wouldn't see thousands of results and become overwhelmed with choices. To find a specific store, try typing in the store's address in the location form. We realize that this can be inconvenient and have plans to redesign the Store Map to show every store from every retailer while still providing a reasonable amount of results per page. How do I setup my preferred categories? To save your preferred categories you must be a registered member. If you are not a member, start by signing up. While logged in, click on Categories in the navigation bar. Select your preferred categories using the the checkboxes. 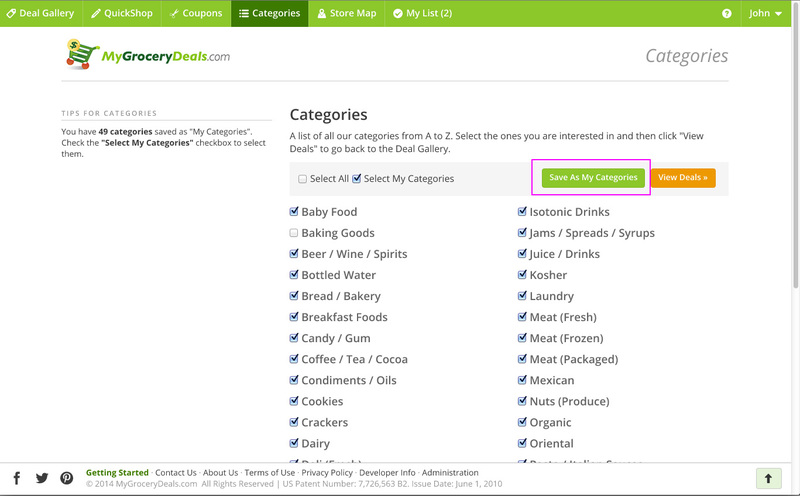 Once you have checked the ones you want, click "Save As My Categories"
Whenever you return to MyGroceryDeals and log in, the Deal Gallery will only show deals from your preferred categories. I can't find the form to set up my Product Alerts. Where did it go? All of our email alerts are currently being redesigned to improve the performance, stability, and experience for our members. Until construction is complete, there is no way to set up Product Alerts. Rest assured, once construction is complete Product Alerts will return and will be a central focus in the new website design. The Deal Gallery is where you can view and search for deals. Deal tiles hold all of the information available for each deal. Here are some of the controls available within a deal tile. Clicking 'More Info' opens an overlay with more information about that deal. In the overlay, you can see the price of that product at other stores, more information about that deal or product, and recommended deals that relate to the one you are inspecting. 'Add to List' adds items to your Shopping List. Click 'My List' in the top navigation bar to see all the deals in your Shopping List. If a deal is already added to your list, you have the option to remove it again right from the Deal Gallery. Note that header tiles may appear differently depending on what sorting options you have applied to the Deal Gallery. For example, when you sort by store, the header tiles tell you what store the deals are in, instead of what category. Enter a keyword in the search bar to find deals quickly. As you start typing you will notice suggestions start to appear below the search bar. You can click on a suggestion or use the keyboard arrows and the ENTER key. These dropdown menus offer quick access to the tools you need to customize the Deal Gallery. For example, if you want to quickly adjust which stores you are seeing, you could use the Stores dropdown instead of navigating to the Store Map. As you click on checkboxes or links in the dropdowns, the Deal Gallery will update in real time to reflect the changes you make. Note that changes you make with the dropdown filters will not be saved to your account. 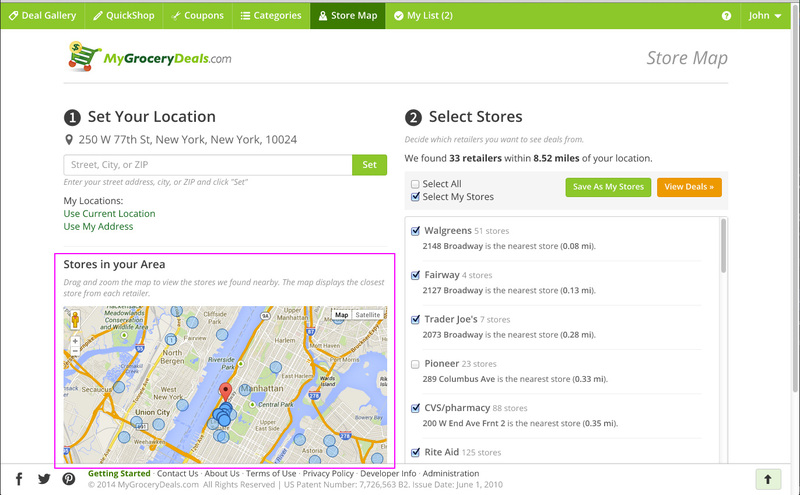 To save preferred stores or categories you should visit the Categories or Store Map pages in the top navigation bar. These results display all of the customizations you have made to the Deal Gallery as well as the Total deals we were able to find for you. As you make changes to the Deal Gallery by performing searches, changing locations, or adding and removing stores and categories, the results will update in real time to help you keep track of what changes you have made. The "RESET" link on the right hand side will clear away all searches or other changes you have made and get the Deal Gallery back to it's starting position. Note that if you have saved categories or stores, those will be included in the starting position when you reset the Deal Gallery. Using the controls in the top right corner, you can choose to display the deals as tiles or list items. QuickShop is where you can set up personalized shortcuts for groups of deals. On the left hand side you will see a list of QuickLists. At the top are the QuickLists created by you and underneath are some suggested QuickLists. Clicking on any of these will take you back to the Deal Gallery to show you deals from that QuickList. You can click on the gray arrow to the left of the QuickList name to expand or collapse a summary of that QuickList. On the right hand side you will see a form to create a new QuickList. Simply type an item into the form and click 'Add Item'. The new item will appear in the list directly below the form. You should only type one item into the form at a time. Click 'View Deals' in the bottom right corner. TIP: Instead of clicking 'Add Item', you can simple press the 'ENTER' key on your keyboard. To save your QuickList for the next time you visit, click 'Save This QuickList'. A popup will appear and you will have to give the QuickList a name. You can also optionally give the QuickList a description. While you are building a QuickList, you can make changes to items you have added. To edit an item, click the 'edit' button on the right hand side or click on the item text. To review or edit your QuickLists, go to the 'My QuickLists' area of your account page. Note that you can only create a maximum of 10 QuickLists. Categories is where you can select or save categories. 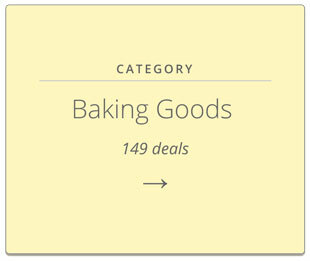 You can simply select the categories you are interested in and then click "View Deals" to see them in the Deal Gallery. Try using the checkbox marked "Select All" to quickly check or uncheck every category. Note that you must select at least one category to see results in the Deal Gallery. If you are a registered member and you are logged in, you can save your preferred categories to your account. Click here to become a member. Simply select the categories you are interested in and then click "Save As My Categories". This will return you to the Deal Gallery with those categories selected. However, since you have saved them to your account, the Deal Gallery will always start with those categories selected whenever you return to the site and log in. To review your preferred categories go to the 'My Categories' area of your account page. The Store Map displays a map of stores in your area and lets you select the ones you are interested in. To set your location enter your address, ZIP, or City name into the form and click "Set". You also have the option to 'Use Current Location' or 'Use My Address' (logged in users only). The area shown on the map indicates the location you have set using a red, teardrop shaped map marker. Small circles indicate stores in your area. You can click on them for more information about the store. Note that the map only shows the nearest location for each retailer. You can simply select the stores you are interested in and then click "View Deals" to see them in the Deal Gallery. Try using the checkbox marked "Select All" to quickly check or uncheck every store. Note that you must select at least one store to see results in the Deal Gallery. If you are a registered member and you are logged in, you can save your preferred stores to your account. Click here to become a member. Simply select the stores you are interested in and then click "Save As My stores". This will return you to the Deal Gallery with those stores selected. However, since you have saved them to your account, the Deal Gallery will always start with those stores selected whenever you return to the site and log in. To review your preferred stores go to the 'My Stores' area of your account page. Your shopping list is a collection of deals that you can export by print, email or text message. Your shopping list is complete with all of the deals you have added from the Deal Gallery. It also contains a collection of Notes you can add yourself in case you want to remember to pick up something else at the store. Note that the shopping list has restricted functionality if you are not signed in. In order to unlock all of the features described below, you must register an account with MyGroceryDeals and login. Use the arrows to the left of each deal to modify the number of each item you want to purchase. You may also click on the number and type in an amount directly. You can remove items from your list by clicking the X in the upper right corner of each item. To quickly clear an entire list, click the 'Clear My List' button. Your shopping list is not just for products that are on sale! You can quickly add additional notes to your list in the Other Items section. Fill out an email address in the form and then click "Send List" to email it. You can click "Use My Email Address" to automatically fill the form with your own email address. Fill out a phone number in the form and then click "Send List" to text a link to it. The link you text will direct whoever clicks it to a publicly accessible version of your shopping list. You can click "Use My Phone Number" to automatically fill the form with your own phone number. Note that you must have a phone number provided in your account settings to use this feature. Click 'Print' to print your shopping list. This will lead you to another page which previews a print-optimized format of your shopping list. We did our best to make sure that printed lists take up as little paper as possible and will continue to make improvements. 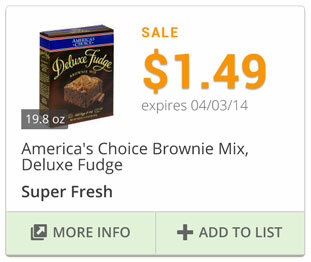 Settings that let you customize your experience at MyGroceryDeals. Several of the features on MyGroceryDeals will require you to log in. By creating a profile or logging in to an existing profile, you allow us to save settings and information that will make future visits more customized. We only need your email address and a password to create your profile. You can provide more information within Account Settings if you wish. This includes information about you. You are not obliged to fill it in, but more information helps to customize your experience on MyGroceryDeals. Filling in your First Name lets you personalize your shopping list. Filling in your phone number lets you quickly text yourself your shopping list. Filling in your address information offers more accurate deal content. Please note that the Email Alert system is currently being improved. Email features and frequency may not be exactly as described below. You can change your alert settings in the My Alerts section of your Account Page or by choosing the options available at the bottom of each email. Simply check or uncheck the boxes and click 'Update Email Preferences' to indicate which emails you would like to receive. There are 4 types of email alerts to keep you posted on the latest deals available at your favorite stores, as well as what's new on the website. This indicates your desire to receive the MyGroceryDeals newsletter. Circulerts let you know when your favorite store (indicated in the My Stores section of your Account Page) has new deals available. These alerts show up in your inbox weekly and will highlight the best deals from the categories you use most. Note that you must select a favorite store before you can receive circulerts. Coupon Alerts are sent out weekly to showcase the best grocery coupons available that week. Clipping coupons can mean big savings, and these alerts can help you remember to use them during your shopping trips. You can set up your own alerts for the products you use regularly. Set up these alerts in the Product Alerts section of your Account Page by choosing keywords that describe products you are interested in (i.e. Coca Cola, unsalted butter) and how often you want to receive alerts. We'll send you an email to let you know when those products go on sale in your area. Go to the Categories section for more information about categories. If you find you only want to view deals at certain stores, you can save those stores here. The Deal Gallery will only show deals from your stores every time you log in. To change your stores, click 'Edit My Stores' and you will be redirected to the Store Map. From there, select the stores you want to save and click "Save As My Stores". 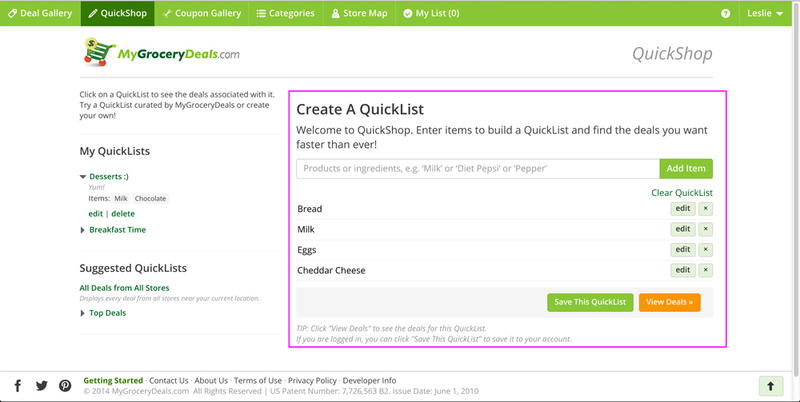 This section shows an overview of the QuickLists you have created. Go to the QuickLists section for more information about QuickLists.